The mission of the GNG is to encourage support and promote a relationship between individuals, families and the earth through gardening, education and events. 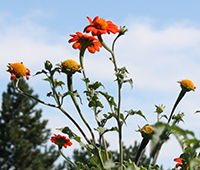 Our garden is open to the residents of Ferndale, Michigan, and neighboring communities. The GNG is an organic garden that generally follows the USDA organic rules. Currently there are several areas set aside for garden members to care for and harvest communally. These include the raised beds towards the front, the raspberry plants along the rear fence, and the children's plots. We also have a communal area for perennial flowers and herbs. The food grown in the community plots is available to both members and local residents who are not garden members. In 2016, we constructed 22 private plots where members can grow their own food, for themselves and their families. Beginning in 2017, we plan to add more.